My daughter had been asking me for three days straight whether we could put a lemonade stand in front of the house. She had that relentlessness that seven-year-olds have when they want something – and they want it now. As someone who has lived in Miami for many years, I can tell you that the prospect of sitting in ninety degree weather is not very attractive. Actually, I am sure that hell is a little cooler than South Florida during the summer. My daughter is immune to the heat. I, on the other hand, am not. And, unfortunately, this subject would not go away. I am the sort of parent who takes any and every opportunity to teach something new to my daughter. I told her that she could have her lemonade stand as long she ran it like a proper business through the whole summer. As luck would have it, I know a thing or two about running a company, so I offered to teach her. Although she had no idea what running a proper business meant, she seemed excited about it. As an added incentive, I told her that, as a “business owner,” she was entitled to spend her money in any way she wanted. As soon as she heard that, she accepted on the spot. I, on the other hand, rubbed my hands – gleeful at the prospect of getting some knowledge through her hereditarily thick skull. The idea of sitting for hours on end under the hot Florida sun held little appeal to me. The problem is that most people in Miami drive in nicely air-conditioned cars. Few people walk. This is a tough challenge if you are in the business of selling lemonade to by-standers. However, there was one thing we remembered: everyone goes to the local parks on weekends to play and get some fresh air. Those people surely got thirsty. Then, the idea came. My daughter would launch a mobile lemonade business. We’d go to our customers directly and hustle some sales. And, if luck was on my side, we could clear the inventory faster than if we just sat … under the hot sun … waiting for clients. Lesson 2: Is your product better? Whenever I see kids selling lemonade or cookies, I always buy some. As an entrepreneur, I feel compelled to help them feel the thrill of making a sale. I recently stopped by a lemonade stand where a kid was selling some nice, cold homemade lemonade. He had the sign, a table, plastic glasses, a big pitcher full of lemonade with ice, etc. In other words, he had the works. I suspect I am not the only adult who ever faced this situation. But this is a real risk when kids sell food. I thought this sales approach could hamper sales, or worse, get us a visit from the health department. We solved the problem the easy way: we bought lemonade pouches (similar to juice boxes) at the grocery store. This method would make our product attractive to parents, who are always sensitive about cleanliness. One thing my daughter learned early on is that finding the right location is very important in the lemonade racket. She knew this firsthand. We frequently go to Kennedy Park, a local park with a “permanent truck” that sells frozen lemonade. They clean out like bandits and have long lines. We actually love going there ourselves. She made a quick decision: we would go to another local park that had lots families but no lemonade truck. 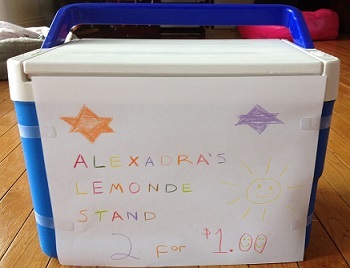 Like every entrepreneur, my daughter had to learn how to raise money. She understood that, without any money, she didn’t have a business. She would have to earn her money the old-fashioned way. She did some chores around the house, which earned her $3. These earnings allowed her to buy her first batch of lemonade pouches. Her startup had officially launched. Lesson 5: Who is your ideal client? Are you certain? Initially, I taught my daughter to focus on families with kids. Obviously, a flash of her ever-warm smile could guilt-trip other parents into buying overpriced, store-bought lemonade for their kids. This worked well for a few weeks, and she always sold all her lemonade. One day, almost by accident, she approached a young couple who were working out with some friends. She looked at the young man, who was in his early twenties, and flashed a smile. She then tried to sell him and his girlfriend some lemonade. The girlfriend completely loved it and started chatting away with my daughter. This guy, not to be outdone by a seven-year-old, was also eager to impress his girlfriend. To show this, he bought half the available lemonades – a round of lemonade for all his friends! Not only that, but he insisted on paying a higher price to “compensate” my daughter for her entrepreneurial efforts. I nodded my head approvingly … the guy was a player. My daughter left that sale with a fistful of dollars and glee in her eyes. I, on the other hand, left with a grin and a better understanding of whom we should sell to. I would have never guessed that single guys trying to impress their girlfriends were our real “go-to” market. 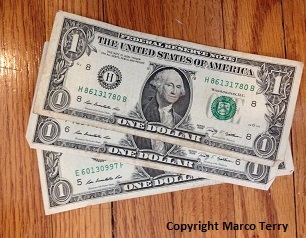 Most entrepreneurs, at least initially, struggle with their finances. They have to learn how to budget money, manage cash flow, and understand how it all works together. My daughter’s business ran into the same problems. It took a while for her to understand how everything worked together and how to figure out if she made a profit. She eventually learned that this concept was very important. Balance sheets were tough to explain, since she had some inventory. The profit and loss statement was a breeze. 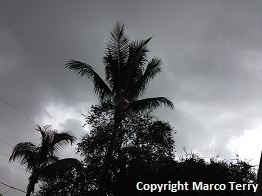 It rains a lot in Miami, especially during the summer months. This was a problem for my daughter’s company. When it rains, everyone stays indoors. No one is out in the parks buying lemonade. It’s totally unpredictable. This held a very important lesson for her. She learned that business was not always predictable and it was best to save for a “rainy day,” as she called it. As a result, she started spreading her money throughout the week. Even better, she started buying the following week’s inventory with her profits before blowing off the rest on candy. School has started, which marked the end of her lemonade business. She went from being a “business ma’am” as she called herself, to being a full-time student. For her, this was an incredible summer in which she learned one of the most useful set of skills a person can have. This kid knows how to size up clients, hustle some product, tally up sales, and track inventory. This is the good stuff – and they don’t teach it in school.